Google always seems to make every “Top 10 coolest offices” list in the blogosphere. There’s a reason for that; they have some very creative thinkers doing the decorating! The company’s latest office design at their new satellite location in Tel Aviv does not disappoint. Check out the photos at officesnapshots.com to see the stunning interiors at this enviable workplace. One thing you’ll notice is the use of graphic printing on walls and dividers throughout the building. There are sweeping natural vistas and close up shots of intriguing yet simple subjects such as water droplets. You’ll even see some text-based images. There’s also a diorama style setup in one room with faux orange trees growing out of the floor matched by a citrus grove on the wall. We think that would be an interesting concept to bring into your own office. 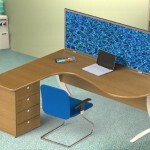 Why not have custom printed desk dividers that carry a theme from the 3D into the 2D around your workplace? What design would you choose? Let us know in the comments.